Still reeling from a cheating scandal in the cricket world and overshadowed by a freshly brewing Memogate political crisis at home, Pakistan's national cricket team bounced back strongly with ODI and Test series wins against Sri Lanka in UAE. In the One Day series decider today, Pakistan succeeded in defending a modest total of only 200 runs. 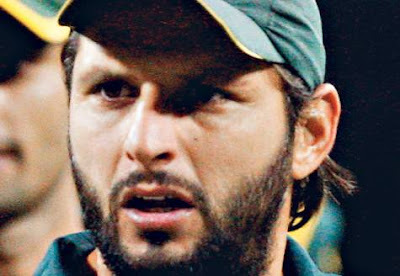 Pakistan's star player Shahid Afridi proved not only his own resilience as a match-winner, but also helped restore his teammates' confidence in the international cricket arena. His allround performance with the bat and the ball was awe-inspiring. After scoring 75 runs with support from tailenders, Afridi went on to dismantle Sri Lankla's batting by claiming 5 wickets while conceding only 35 runs. "The Pakistan cricket team must be the most resilient entity in the world. Exiled from playing at home, repeatedly riven by internecine bickering and factionalism, and with three of their top players, including their two best bowlers, recently imprisoned for spot-fixing – and still last week they completed a Test series victory against Sri Lanka......the endless production line of freakishly talented Pakistani players continues to draw the sting of everything that happens to the team. That production line is driven by the deep love for the game in the country – a love that appears as resistant to the repeated abuse it receives as the team does. Against the backdrop of the London trial, their win in the UAE, against a side ranked above them, represented a heartening refusal to be steamrollered by events beyond their control. It's a quality every Pakistani cricketer needs in abundance." Pakistanis are no strangers to the oft-repeated apocalyptic forecasts of imminent collapse of their nation that have been regularly dished out by many western leaders, leading analysts and mainstream media over the years. The 2009 Swat valley insurgency and 2010 and 2011 floods sent these pessimist pundits in overdrive yet again as the images of the victims of these crises were widely distributed and discussed at length. Pakistan continues to face major problems as it deals with the violent Taliban insurgency and multiple crises of stagnant economy, scarcity of energy and the lack of political stability and sense of security. The unfolding Memogate scandal is yet another reminder of the daunting challenges the nation must deal with. The bumbling political leadership of Pakistan is incompetent and corrupt. However, what the prophets of doom and gloom often discount are key factors that keep the nation going, including the resilience of Pakistan's people, the extraordinary capabilities of its large and growing urban middle class, and the stabilizing influence of its powerful military. Pakistan is just too big to fail. I fully expect Pakistan to survive the current crises, and then begin to thrive again in the near future. Resilience against failure and potential to succeed are poles apart. Between the two, there exists the vastness of mediocrity, not some kind of energy stream that propels one to either of the 2 poles. If one were to harbour your inflated sense of optimism, a case where pak actually survives could be cosidered. But mere existence or survival does not gaurantee success. Given the continuing drama (worthy of soap) and lack of credible catalysts to correct the socio-political crisis (memogate), the liability of pak's existence could simply continue while maintaining status quo. Pak MIGHT be 'too big to fail'. But even if it saves itself, can it avoid the ominous 'average'. Is pak big enough, or smart enough to suceed? Ashmit: "Resilience against failure and potential to succeed are poles apart." I live in Silicon Valley where all great successes are built on great failures. Those who never fail are those who are risk-averse and never set their sights high enough. They only achieve small successes, because they never have the opportunity to learn from failures. "Failure is only the opportunity to begin again, only this time more wisely." "All my successes have been built on my failures." "There is no failure except in no longer trying. " Pakistan did need this win. I wish people persevere like this in coming elections too and throw the bums out. Many Arabs want to see Pakistan as the world’s sole super power. The survey, which was conducted during the last half of October, was based on detailed interviews of some 3,000 respondents from urban centeres in Egypt, Morocco, Jordan, Lebanon, and the United Arab Emirates (UAE). It also included Saudi Arabia, the results from which, however, arrived too late to be weighted with the other five countries. For Pakistan, the significance of their thumping victory in the first Test can hardly be overstated. Their coach, Mohsin Khan, was merely telling it like it is when he said: "It's great to be part of this wonderful unit and the win against England is dedicated to all Pakistanis around the world. Wherever you are, this win was for you, and my team and I are very grateful for their continued well wishes and support." The victory by 10 wickets was one thing but that it came against England in the first Test between the countries since the match-rigging events of 2010 is quite another. Rightly or wrongly, Pakistan view this series as one of rehabilitation in which a grim chapter can be closed and the image of the team as pariahs of the sport laid to rest. Mohsin has stewarded them with passion and care since he was appointed as interim coach last year. With the Pakistan Cricket Board apparently pursuing Dav Whatmore as the permanent successor to Waqar Younis, some of Mohsin's comments might have been taken as a job application. "There have been well documented and unwanted activities involving former Pakistani cricketers a couple of years ago, which spoilt the name of Pakistan cricket and gave the nation of Pakistan a bad name," Mohsin said. "Our aim was to turn that around and to provide a boost to the nation and fans and to show the world that there is more to Pakistan cricket than just negatives. "Cricket is not just a game in Pakistan, it's a way of life, it's a passion. So I feel the win was a gift for the people of Pakistan. The Pakistan Cricket Board is working tirelessly to improve the image of Pakistan cricket and to bring normality back." There is some way to go and Pakistan's form can never be taken for granted. A fitful past is not easily overcome, though six successive unbeaten Test series and now this victory have clearly changed their opinion of themselves. Whatmore, a former coach of Sri Lanka and Bangladesh, has been to Pakistan for talks with the board and is favourite to be appointed after this series. But Mohsin would be a viable alternative. The artificial fuss over the action of match-winner Saeed Ajmal might have perplexed some previous Pakistan coaches. Mohsin took it in his stride. "I'm not worried about the comments regarding Ajmal's action and neither is Saeed," he said. "You do find some people in the media who try to create a few unwanted things which should be kept away from cricket, but there again when we came to the UAE there were questions directed to [captain] Misbah-ul-Haq and myself about the issues in 2010 in England. Our response was simple and was that we are just here to play good positive cricket and nothing more than that." The tourists finished on 382-3 in Pallekele to claim a seven-wicket win in the final and decisive Test. Chasing 377, Pakistan were 13-2 before Younis Khan and Shan Masood put on 242 for the third wicket. Masood was out for 125 but Khan was 171 not out as Pakistan reached the target to move to third in the Test rankings. The total, sealed when captain Misbah-ul-Haq (59 not out) hit Jehan Mubarak for six, was also the highest run chase made in Sri Lanka and the second highest made in Asia. Pakistan had gone into the final day needing 147 more runs for a memorable win and off-spinner Tharindu Kaushal drew Masood out of his crease to have him stumped. But that was the only wicket Sri Lanka managed as they suffered a first home series defeat by Pakistan since 2006. Sri Lanka drop four ranking points, but remain seventh on the International Cricket Council's list. Pak Lady Health Workers "Best in the World"!